Russian singer Yulia Samoylova said she can’t comprehend what scared the Ukrainian authorities so much that they banned her from entering the country for three years. Samoylova said she still hopes to perform at Eurovision in Kiev this May. “It is very funny to watch [the situation] from the sidelines, because I don’t understand what they have seen in me. They have seen some kind of threat in me, in such a little girl. By and large, I’m not feeling down. I keep on practicing, as for some reason I believe that everything can still change,” the singer said, as cited by TASS. The 27-year-old, who uses a wheelchair, may be prevented from going to this year’s Eurovision Song Contest after the Security Service of Ukraine (SBU) announced on Wednesday they were banning the Russian singer for three years over her performance at the 'World of Sports and Kindness' music festival in Crimea in June 2015. Kiev says Samoylova did not request permission from the Ukrainian authorities to enter the peninsula, in violation of Ukrainian law. The SBU announcement was met by a wave of indignation from Russian officials, lawmakers and music industry professionals. 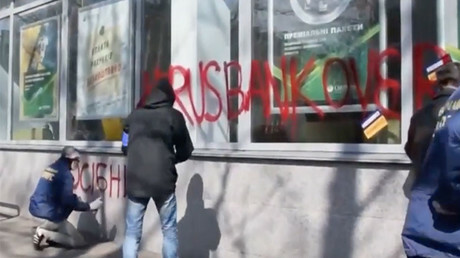 Maria Zakharova, spokesperson for the Russian Foreign Ministry, highlighted what she described as the hypocrisy with which Kiev insists that the law should apply to everybody, while at the same time undermining this rule by imposing restrictions on Russian media and allowing vandalism toward Russian banks. “For some reason, this principle has been invoked on the territory of Ukraine only in respect to the Russian singer. In respect to other people, including Ukrainian citizens, Kiev does not intend to show any adherence to principles,” Zakharova said, adding that the way Europe reacts to the ban on Samoylova will show its true face. “I think that now comes the moment of truth for the European community: whether it is going to do the SBU’s bidding and encourage Ukrainian radicals to attempt further “heroic deeds,” thus burying all the efforts made within the Minsk process, or prove that Europe, with its fundamental values, for which Ukrainian politicians always stand for in word, is still alive,” Zakharova wrote in a Facebook post. Russia’s Channel One TV, which picked Samoylova to represent Russia, has already announced that if she is forced to miss this year’s event, she will take part in the contest next year without needing to go through a selection process.